It all started in 1920 when a young Percival Charles Howard starting delivering and selling milk to the local community around King's Cliffe near Peterborough. In 1920, Percival Charles Howard, left School aged 14 years and from a small holding along Apethorpe Road Kings Cliffe, his family purchased some cows and Percy started out selling and delivering milk to households in Kings Cliffe. This simple step was to be the foundation of the family business. In the late 1920's Percy rented the Glebe Farm in Kings Cliffe and commenced farming . This was a big step for the young man. On Christmas Day 1933, Percy married Connie Blake, the village Sadler and Harness makers daughter. Connie was a school teacher but soon adapted to being a Farmers wife, but more importantly they were to also form a strong business relationship. In 1938 the family moved from Glebe Farm to Huskinsons Lodge Farm, still in Kings Cliffe. It was here in 1939 that Percy found surveyors on his land - they told him they were from the Air Ministry and that the land was being requisitioned for an Air Field. Faced with the prospect of loosing 1/2 his land, he did not miss the opportunity and purchased his first lorry in 1939. 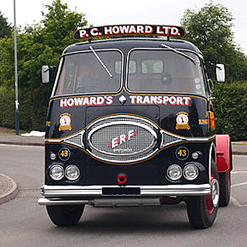 As a result of this, Percy diversified from Farming into Haulage - in the early 1950's he diversified into buses, although lorries remained a part of the business. In 1944 the family moved again from Huskinsons Lodge to Rosary Farm, Park Street, Kings Cliffe. In the early 1960's their three eldest sons, Roy, Bernard and Bill joined the business. They soon developed their own areas of expertise. 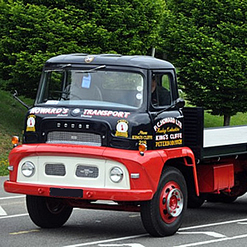 In 1966 they purchased their first artic and at this time their major customer was 'London Brick' based at Yaxely. Percy Died in 1968 and Connie continued to be the guiding light up until her death in 1975. By this time Anthony, the youngest son, had joined the business and they had started undertaking distribution work for British Steel at Corby - a relationship that was to last for over 25 years. By this time Bernard had become the driving force for the business, looking for new opportunities but always supported by his brothers. In the early 1980's the family purchased a new site at Crucible Road, Corby and diversified into warehousing. This was a particularly challenging time as it was when British Steel stopped Steel making in Corby and new businesses were starting to emerge. Until now, the main business was based in Park Street, Kings Cliffe, which was near the centre of the village. In 1987 the business was relocated from this site to the site that the business now occupies at 'West Hay' Stamford Road, Kings Cliffe. This site is two miles from the village and adjacent to the A47, which provides an excellent connection to the Motorway network. In the late 1980's the Business started to move away from servicing the Heavy Industries to the developing Parcels and Pallets Markets and in 1994 the business became a founding member of the Palletways Network. In 1995, Bernard decided that the time had come to let someone else take the strain of managing and developing the business. It was at this time that Andrew Howard, a member of the third generation of the family, joined the business – prior to this Andrew had Qualified as a Chartered Accountant and built up a wide range of experience in different fields. Andrew decided to focus the business on the distribution of Palletised Goods, using not only our own fleet of what is now 100 vehicles, but also using the Palletways network. 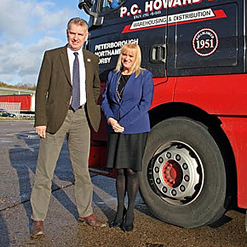 In 2005 the Company opened a new depot at Brixworth, Northampton, and now has three depots with additional operating centres at Huntingdon and Oakham. We also opened a depot in Swindon in July 2012 which is currently managed by Marcus Thompson. During the same time the business as developed a process of continual improvement and to achieve this as embraced the use of IT , from the receipt of orders, the planning of deliveries or the picking of goods with in our warehouse , confirmation of the completion of the delivery process, and finally invoicing. We also make use of Vehicle Tracking and track and trace facilities.